Most of the companies today are data-driven, innovative and are able to scale their data rapidly and respond to the market. NetSuite OneWorld helps in delivering in real-time, amalgamate global business management platform for the enterprises which manage multinational and multi-subsidiary operations —at a fraction of cost for traditional onpremise ERP solutions. It also helps MNC’s for streamlining multi-subsidiary operations and provides a real-time visibility at the local, regional and headquarters level. It also helps in creating a standard business process which can be developed by the company and deployed across divisions which will help to subsidize with a click of a button. This will help in ensuring a standard running process all throughout the world. NetSuite OneWorld provides an end-to-end solution which will be delivered to meet critical and time-consuming regulatory financial compliance requirements such as IFRS, SOX and GAAP. It also helps in providing organizations with real-time global business insights with the help of role-based dashboards. The business heads and stakeholders get a real-time view of the business performance. The key metrics can be drilled down within the organization’s global operations, eliminating the need for the custom reports which will just take hours to generate. 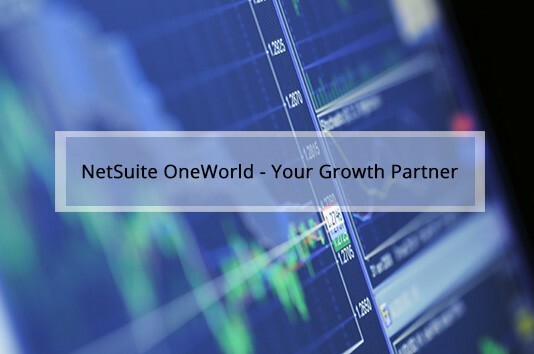 Why should you use NetSuite OneWorld? The basic functionality of NetSuite OneWorld is to help global businesses, driving finance and operational efficiency, deliver real-time visibility and consolidation, while providing the flexibility for customizations to corporate and subsidiary needs. It will give the corporate and different divisions a clear view in the level of business performance. It gives an insight from summary to a detailed one through the financial and operational role-based dashboards and also provides realtime reports. The cloud delivery enables a global business for running both a corporate and subsidiary operations without a costly on-premise IT infrastructure and resources. It also helps in cost cutting and enabling the companies to efficiently extend standardized ERP to every business. NetSuite OneWorld helps in accelerating the financial processes with the consolidation of multi-currency and a real-time roll-up across the accounts which are receivable, accounts payable, payroll, inventory, billing, invoicing and order fulfillment, from local in-country operations to the regional offices and global headquarters. The web-based access provided by NetSuite OneWorld will enable your employees to access NetSuite anywhere around the globe. With the support of all popular mobile devices, it helps customers to get an access to data and functionality they require from the palm of their hand. It is built around the robust financial reporting capabilities which help the organization in enabling and understanding as to what is happening across the business in real-time. In addition to this, they also provide a flexible hierarchy which will allow the business to entirely run the structure with ease. It is designed to provide an instant global view of the business with a subsidiary specific drill-down which will can help in a quick and better understanding as to what is going on anywhere around the world. The NetSuite multi-currency management helps in supporting 190+ currencies and the exchange rates (which will enable for doing business with customers as well as vendors) and a wide variety of payment options. This system also provides a real-time currency conversion and financial consolidation for the global operations. Complete ranges of international tax structures and restate currencies and consolidated financial reporting across business units. It is a support for building both a global standard and country-specific requirements. You can always ensure on audit trail, built-in analytics, access logs and workflow and an ability to drill down the underlying transaction detail which will ensure that you will always have documentation support. Furthermore, it also helps in configuring the system behavior for supporting your own process requirements which will help you in meeting the needs of the local compliance obligations. By recognizing the critical needs for the businesses to meet the local indirect tax obligations wherever the business is done, it provides the out-of-the-cloud pre-configuration for more than 50 countries. A built-in tax engine is provided by NetSuite which is configurable to your specific business needs. Taxes can be calculated in real-time on sales and purchases. We at Inspirria Cloudtech, adhere to NetSuite’s proven NetSuite One methodology. 1. We initiate as we understand all your objectives and deliver the functional scope. 2. We analyze your business needs and develop a project work-plan according to that. 3. We design with the help of Customization Solution Design & Integration Design as NetSuite addresses your business needs. 4. We configure the NetSuite’s solution in a way that it adapts to your business. 5. We validate the solution so that it is deployed easily. 6. We deploy the solution and your business is now powered with NetSuite. 7. We optimize, learn from the solution and move to the NetSuite support. Are you planning to set up a new business and in search of the best ERP solution? We at Inspirria Cloudtech, are here to help you. You can take us as your secured cloud provider partner and NetSuite solutions with decade plus of experience working with 450+ Cloud projects. We push productivity to its optimum level with some proven solutions that are used by best companies all over the world.